Here it is! 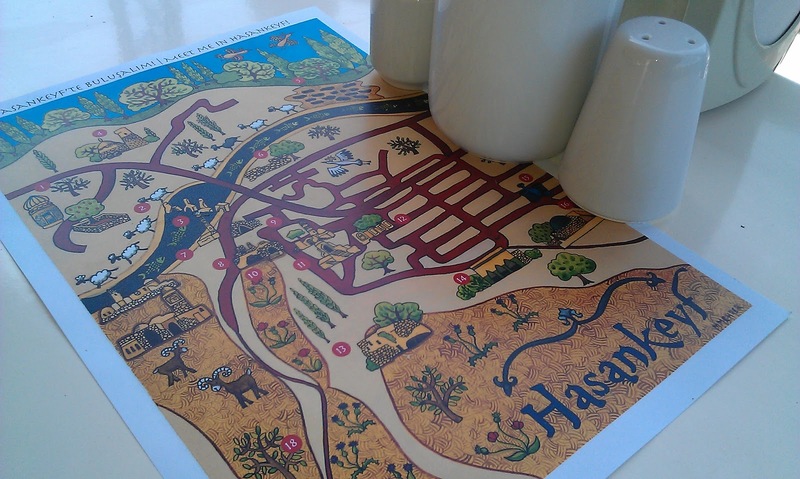 Hasankeyf Matters is proud to share the new walking guide to Hasankeyf, and we invite our readers to download the map here and print it for their own use. We hope the map will give visitors a hint of the treasures that Hasankeyf holds, but the best discoveries, of course, will be found in the company of a friend with local knowledge. The idea for a new walking guide started with archeologist and Hasankeyf native Necdet Talayhan as a way to spotlight the treasures that lie beyond the Citadel (closed to visitors in 2012). Necdet’s detailed map of Hasankeyf’s archeological sites not only piqued the interest of the Batman Museum (which went on to publish a new map focusing on the Lower City), but it also inspired Istanbul-based Canadian artist Melanie Mehrer. “It’s a kind of miniature,” says Melanie, referring to the Islamic tradition of textual illumination, “and like a miniature, it tells a story.” The story of Hasankeyf, situated between the Tigris River and the sheer cliffs at the northern edge of the Tur Abdin Plateau, is a very long one – stretching back 12,000 years. The guide published here is schematic. It’s designed to provoke the imagination, to prompt questions and conversation. Anyone interested in learning more the town’s archeological monuments and nature trails should also consult Hasankeyf Matters’ photos and annotations (prepared by John Crofoot) on GoogleMaps My Places. These maps are just the beginning of what we hope will be a long and fruitful effort to mark and chart walking trails in and around Hasankeyf. In the meantime, we encourage anyone who really wants to see Hasankeyf and understand its culture to explore the town and its surroundings with a local guide who has grown up exploring the town, its canyons and who knows the currents of the river. And please note Necdet’s final advice to visitors: “Don’t cut your visit short.” Hasankeyf rewards those who take their time. May time, in turn, reward Hasankeyf. Special thanks to Melanie Mehrer, Marta Marszal, Necdet Talayhan, Jonathan Lewis, Zeki Yemez, Helen Southcott, Jennifer Hattam, Egemen Demircioğlu, Dan Tucker and John Crofoot. 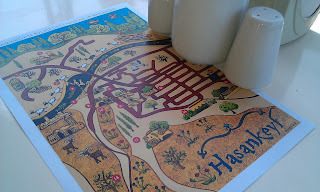 Thanks, Hasankeyf Matters, for creating such an informative and beautiful map. We used it throughout our visit to Hasankeyf during the Ingathering and now want to frame it! Thank you, Senior Dogs! For you and any other readers who might be interested, we have full-size (approximately A3) museum-quality archival prints of the painting available. Proceeds go to support local outreach in Hasankeyf (e.g., sports and arts equipment for school children, etc.). Thank you creative people for sharing your beautiful map with the world. I will take it with me on our study trip to south eastern Anatolia in October! Join our mailing list to get updates on the latest news and upcoming events.